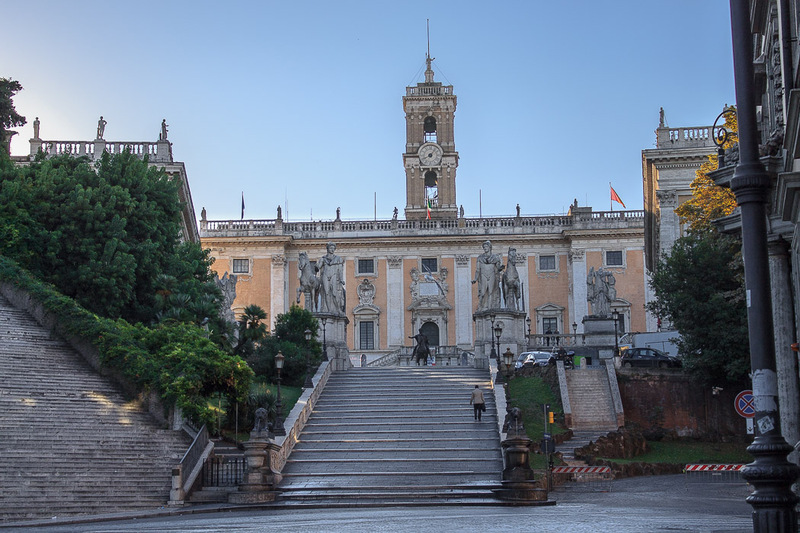 There is a basalt Egyptian Lion Fountain at the bottom of each of the ballisters of the ramp (the Cordonata) leading up from Via del Teatro di Marcello to the Campidoglio. These two small fountains with serious-looking lions were restored in 1955. They are actually copies of the black granite originals from the Temple of Isis, which have been in the Vatican Museum since 1880. On special occasions during the 17th century the fountains were used to spout wine instead of water, one with white wine and the other with red wine, similar to the way wine ran from the Fountain of the Mask. 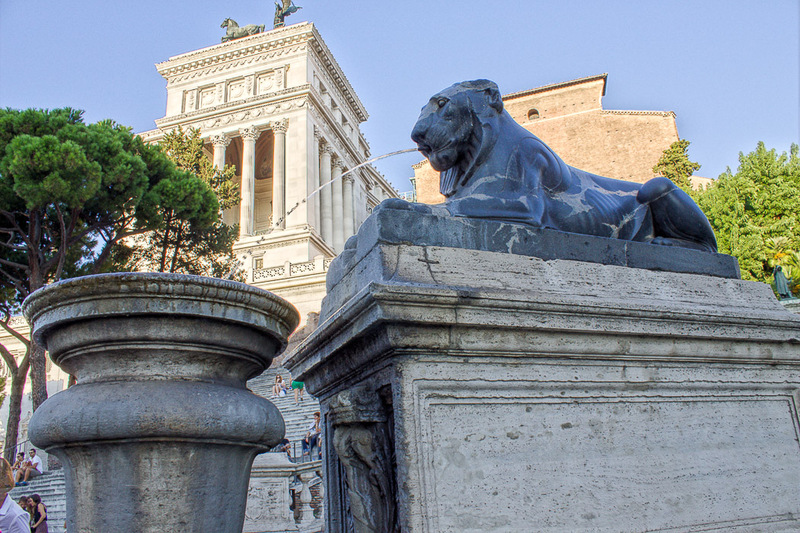 The half lion, half sphinx pink-veined dark gray granite of these two Egyptian water fountain sculptures make a pleasing contrast to the travertine steps and railings, and serve as a precursor of the bronze statue of Marcus Aurelius in the center of the Campidoglio. These lions were found in front of the church of Santo Stefano del Cacco, whose name came from the two black basalt lions from Numidia that were in front of the church during the time of Pius IV. 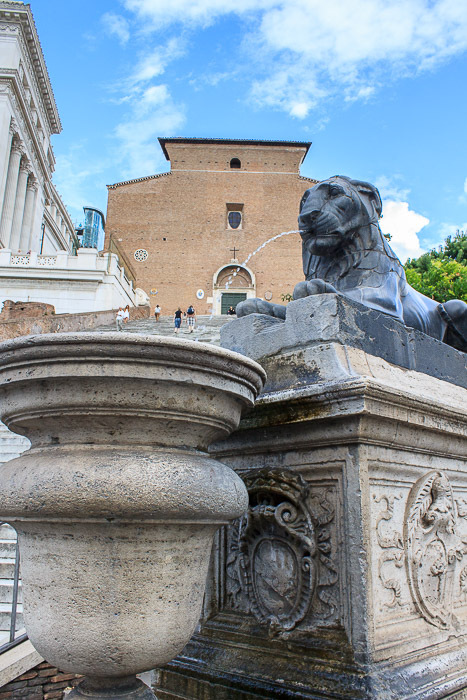 The two lions were transported to the Capitoline and set up as ornaments at the bottom of the steps that form the ramp leading up to the square in 1562. 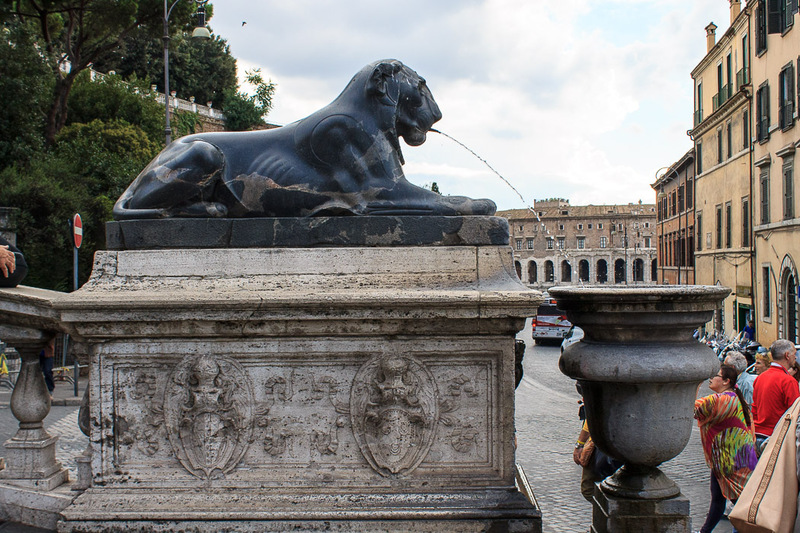 The idea of animating these two motionless lions by turning them into fountains occurred as soon as water had been brought to the Capitoline. This was at the same time as the construction of the large fountain below the Senate Steps in 1588. When the necessary holes had been made and the spouts put into their mouths, the lions adapted to their new tasks. The lions were actually made two thousand years earlier in the arid, desert land of Egypt, during the early Ptolomaic period (late 4th or 3rd century BC) for a sanctuary somewhere in Egypt, and probably brought to Rome during the reign of Domitian. 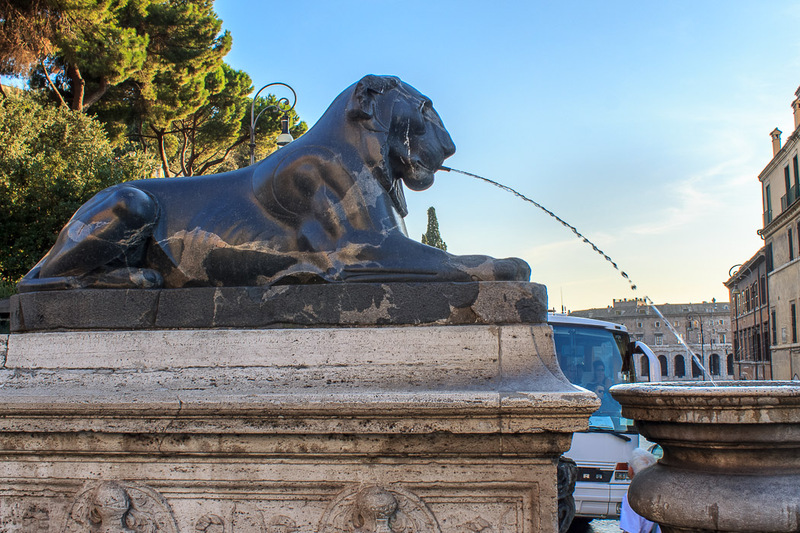 See all Capitoline Egyptian Lion Fountains photos.